Want daily pics of beautiful Corso’s? Click here to follow us on Instagram, we post pics daily! house, then you have come to the right place! We have years of shipping experience and have had no bad experiences, so it won’t be a problem at all shipping to your home town. Our vet has years of experience with cropping Corso ears, so if you want this done we will be happy to do it for you and we get a special price on it that we will pass on to you, saving you a ton of money. 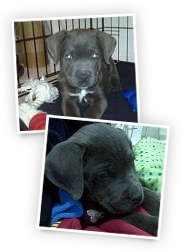 All of our puppies come up to date on all shots and dewormers making sure your puppy is healthy. 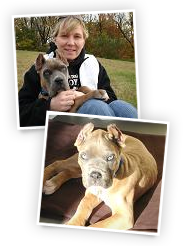 If you can’t pick up your puppy at 8 weeks old breeders charge $75/week to hold them. We will hold the puppy up to 10 weeks old without any extra charge. We start socializing your puppy at 4 or 5 weeks old. We give a 2 year health guarantee on the hips of our dogs, we also dock the tails and remove the declaws. We take the time to send you pictures and videos every week or so as well as give you inside info on how each puppy acts and how they are different. This way you can feel 100% comfortable you are getting the right puppy. You receive all of the above. 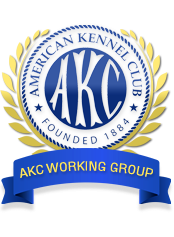 We are very flexible and love to talk about our puppies, feel free to call or email us with any questions you might have. Hey Shipley’s, Enzo is everything we were looking for in a dog. He is extremely intelligent and has been a breeze to train. He is also very alert and loyal around the family but knows when to use his judgement and submise in certain situations. He is awesome around kids, stangers, and especially other dogs. No matter what size, he’ll approach any dog to play. We cannot take him anywhere without someone stopping to pet and ask about the breed and we cannot say enough about him. Again, I can’t say enough about how happy we are with him and how great the experience was with you guys, thanks again! Wylson is our first dog. 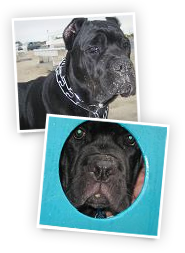 His temperament is exactly what Shipley’s Cane Corso promises! 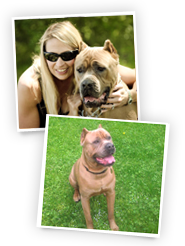 He is very friendly with kids, loves to play with other dogs, and awesome with friends. He loves his family and is the perfect guardian of his domain. Our experience with Justin can’t be matched anywhere. 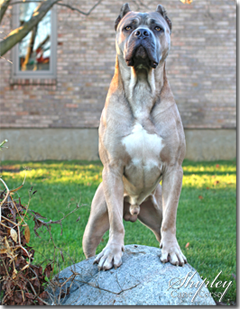 If you want knowledge about the breed before you buy, Shipley’s Cane Corso can’t be matched! Wylson is 4 years old now and a conversation magnet. He loves the attention! We are now ready for another pup. 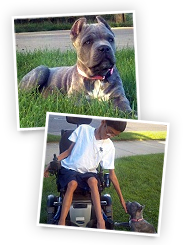 Justin and Shipley Cane Corso is the BEST!! I just want everyone to know that after owning 12 dogs and currently having 7 in my home, what a delight it has been to raise my cane corso named “seven”. She is loyal, friendly, outgoing (with people and dogs) and has the sweetest eyes that make everyone she meets fall in love with her! At seven months old she passed her basic obedience class and is well on her way to becoming a certified therapy dog. I can’t wait to bring her into hospitals and nursing homes for her to share her love with people. I could write paragraphs about how wonderful she is! She comes to work with me every day and wins over the hearts of those she meets. In fact she has her own fan club and a long list of people that want to make her their own. I just love this dog! Thank you Justin! Cain is a great addition to our family. He is a very intelligent and a stunning puppy. He draws attention from people where ever we go. He is full of energy and boundless amounts of personality and loves to play. 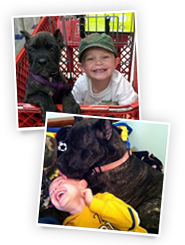 Choosing to purchase through Shipley Cane Corso’s was the best decision we could have made. The process was smooth and we received a great addition to our family. We love Mojo so much! He is an awesome dog. He’s very smart, family oriented, protective and funny. He and our Aussie mix just love each other. He’s been camping and boating with us, and he loves swimming. He fits in or family perfectly and we can’t thank you enough. We will definitely be be getting another when the time is right. Thank you! Enzo is now 2 yrs and 4.5 months old. He is so gentle and loveable, but yet is keen to alert us if there is anyone near the house. 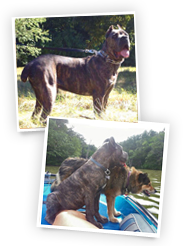 We take him to our camp and he does great with other dogs big and little as well as children. We can not take him anywhere without someone stopping to ask about him, or exclaim how beautiful they think he is. He is happiest when he can remain with us all day long. He has brought us so much happiness, and we thank you for the wonderful dog! 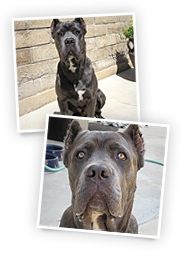 Solomon is my third dog… But first Cane Corso. I’m amazed at how fast he is learning. Sit, down, stand, wait, stay, come, and heel at 4 months old! But I can’t take a walk without being stopped every 5 minutes!!! Everyone loves King Solomon!!!! We are having such a wonderful experience with our new puppy. She is a very sweet, loving, and determined little girl. My son Cole and I love her very much, Cole told everyone in the family not to buy him a birthday present because the puppy is the best gift he could ever get. Thank you again, she is beautiful. "Chica" was my first pick after watching the first video that Justin sent me. She was the runt of the litter and is quickly becoming the beautiful dog she is meant to be. At barely 3 months old, she has been around my 1 ½ year old grand daughter and 2 year old niece and she took the abuse that the little ones dished out and is already protecting my son. She is quickly learning and already claiming and protecting her territory. Justin was very informative, helpful and patient throughout the process. His knowledge and the testimonials are what sold me on their dogs. 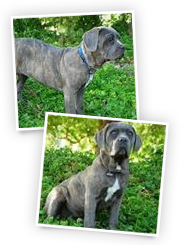 I have and will continue recommending Shipley Cane Corsos. Thanks again for the great addition to my family. Cricket is the smartest dog we’ve ever owned. She learned all the tricks in the book in the first 3 months. She’s the biggest sweetheart and lover but knows when to protect and alerts us when people arrive on our farm. She’s very athletic, we even took her on a 4 day backpacking trip in the mountains and even carried her own pack. People comment how gorgeous she is all the time. 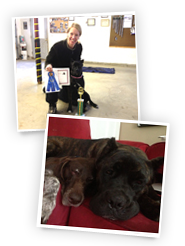 We are so happy we came to Shipley Cane Corso for our Corso. Delilah is an awesome pet, we shopped specifically to find a breeder focused on temperament and who could demonstrate good natured, spirited, and well bred animals. We were so impressed with Legend and Delilah is such a fantastic animal, people comment about how regal she is, and how good natured she is every where we go. She is so good natured that we got her therapy certified at just 1 year old, and she is a wonderful therapy dog who enjoys her service just as much as her nap times with our kids and watching TV with the family. 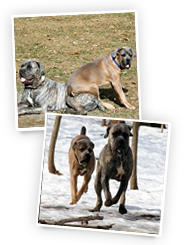 I had never owned a Cane Corso and now I’m sold on the breed, and Shipley Cane Corso. Kalliope is a beauty!! And for female she is getting BIG ~ 113lbs! Everyone who sees her is amazed by her!! And she’s a big baby too because she loves to cuddle. Her little brother is a miniature pinscher. She thinks she’s a lap dog like him. Our Corsos are phenomenal. 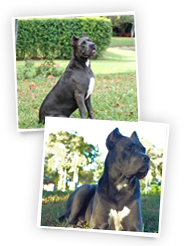 Shipley Cane Corsos are the perfect blend of intelligence, temperament and physicality. They are gentle, protective giants! My wife is not really a dog person, but she was so taken with Carson (our first Corso we bought from Shipley Cane Corso) that she agreed to get one more. 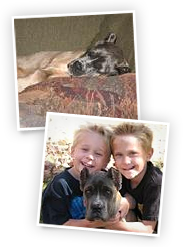 Hudson and Carson are intelligent, confident, and very friendly. They love playing mostly with each other. When we are out there is never a time when people don’t stare and comment about the two beautiful dogs. Thanks so much Justin I couldn’t imagine having better dogs. Damas is a wonderful addition to our family and is much loved. He has a great temperment and has a high energy level which has translated into easy training. He patrols the yard off leash and hasn’t left the yard once. Damas is the talk of the neighborhood and has many fans. He is everything that I wanted and more. The experience with Shipley’s from beginning to end was easy, straight forward and held no surprises. In my heart, Damas is far more valuable than what I paid for him. Thanks Justin! Chaos is our first Cane Corso, and she is an AMAZING dog. My daughter has always been afraid of the dark since she was 2, and she is now 4 and sleeps in her own room because her best buddy Chaos sleeps with her. 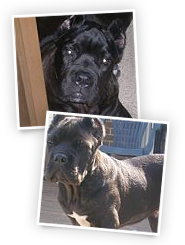 We have had a great experience with Shipley Cane Corso, and their dogs are just what they say, wonderful temperment and beautiful dogs. Chaos loves her kids!! Thanks Shipley’s for an AMAZING dog. We bought our very first Cane Corse from Shipley 2 years ago. Justin was ever so patient with us and the many questions that we asked him. We have had Rotts forever and still do. 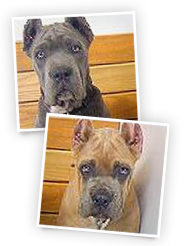 But we had heard so much bad PR on Cane Corsos that we were a little bit off and on about owing one. So we got our Ricco from Justin and that was def the right choice. This truly is the sweetest dog that we have ever owned. He lives with 2 Rotts, one very senior and one that he thinks is his litter mate, that would be Kaeto. Ricco is actually better dispositioned then some Labs that we know. He is just a happy go lucky guy and he loves his brother no matter what. He is always happy and playful, does some of the strangest contortions that we have seen a dog do. He really is an entertainer and we love him so much. Thanks Justin, you do such a nice job with your dogs. 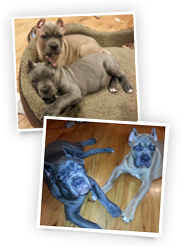 Thru my research on Cane Corso’s, I wanted to find a quality breeder to insure a clean bloodline. We found that in Shipley’s. Justin was very knowledgeable on the breed and did a great job on answering our questions. Harley has been a great addition to our family! She is such a quick learner, playful, and a great watchdog. When we take her out she is such an attention hog! Thanks again for an enjoyable experience and many years of enjoyment to our family! We made a good choice buying this excellent pup! Justin you made my choice easy to decide getting a puppy from you. Your experience, patience, and understanding that you discussed with me over phone a couple of times is what convinced me to buy from you. If I had to do this all over again I would change nothing. My puppy is very loving, loyal, and has an excellent temperament. When I’m ready to buy a black male corso I will purchase him from you. Thank you again Justin. 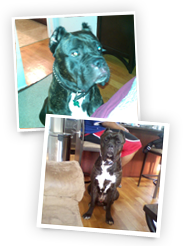 I enjoy my Cane Corso from Shipley Cane Corso, this was the best spent money ever. She is a part of the family, and we wouldn’t trade her in for the world. Nayla is very friendly, fun loving, and very playful. Also Nayla is very possessive of me, she has single handle cut into my love life. A quick sniff of strangers and if they are good people in the dog world, she will be your best friend. Every where we go Nayla is the topic of all conversation…only one person has been able to guess the breed. And her color is so unique. I could not ask for a more beautiful Corso. Thanks again Justin. 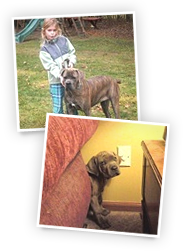 My Experience with Shipley Cane Corso was great!. 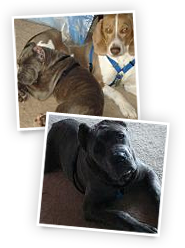 Edward is my first Cane Corso and he’s best buds with my three year old bulldog. Edward is very calm and good around people and other dogs, yet he’s alert and on guard if there is a loud unexpected knock at the door. 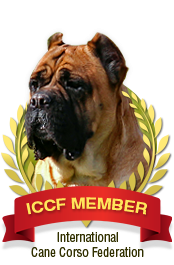 I highly recommend Shipley Cane Corso as Justin was very helpful and accommodating and if I every get another Corso, Shipley’s will be my first choice. 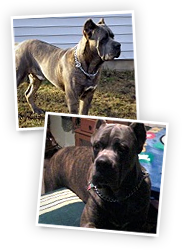 It took my husband and I a long time to find a breeder of Cane Corso’s that seemed to have a true love and respect for the breed, we definitely found that with Shipley’s. We were a little nervous about shipping our new puppy to Canada, but Justin and his family were very reassuring about the whole process and answered any and all questions we had along the way. 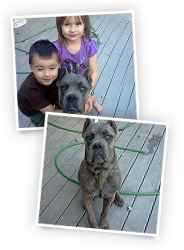 We now have our beautiful Cane Corso (Riddick), who has been a wonderful addition to our family. He is very smart, loyal and is the envy of every owner at the off leash dog park we attend. He is great with kids, all other pets and was very easy to socialize. Thank you Justin and family for making our experience so wonderful. 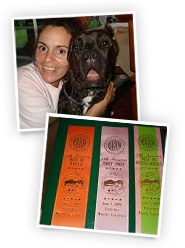 I am absolutely thoroughly impressed with my Cane Corso from Shipley CC. When they say they specialize in temperament, they mean it. Being such an intelligent breed they understand more than most dogs, but good genetics depend on the breeder. I was apprehensive buying such a powerful breed, temperament and socialization are very important to me and I can honestly say I’ve never seen a more well-behaved puppy. Justin was consistently responsive in helping any of my needs, before and after the purchase, and for that I’m grateful. 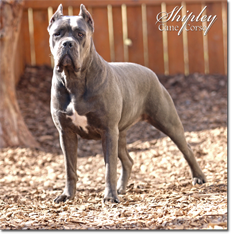 You can’t go wrong with Shipley Cane Corso! I got Creasy from Shipley in November of 2010. I brought him home at 7 weeks and he potty trained very quickly. He has a laid back demeanor and is goofy at times. 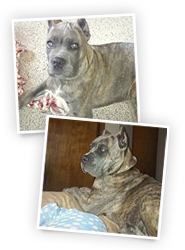 Creasy is very well behaved and loves being around kids. I take him on walks in the country and he always stays near by, does the same in the front yard even if he sees something that interest him. Hi, Bella’s temperament is everything that you guarantee. We have acclimated her to small children with 2 families that Meaghan baby sits for as we have no small children in our home. She is very polite but is showing her protective side, no strange dog will approach on her watch! We were a little apprehensive about ordering our dog online, but we are 100% satisfied with the service of Shipley Cane Corso. I would recommend them to anyone! 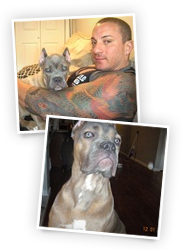 Maximus is beautiful, playful, friendly, and gets along great with kids and is extremely smart. We love him very much! Thank you for such a great dog! 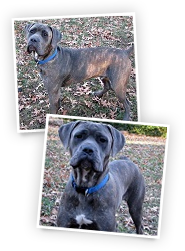 We are so happy with our Cane Corso, his name is Shogun and he is approximately 6.5 months old. He weighs a little over 70 lbs and is extremely loving and affectionate. He has bonded with my family very closely. He happily protects our home, but is accepting of visitors once he sees our approval. I have never known a more affectionate and intelligent dog. Like any parent, we think we have the cutest puppy ever! We have one daughter that has night terrors and anytime she starts an episode, Sophia is right there waking me up (as if i’m going to sleep through it, LOL). And, she will not let our 3 & 5 yr old daughters play outside by themselves. If they’re out playing so is she. She will not leave their sides! She is very patient and loving! She even snuggles the cat 🙂 We love her! I’m really glad I chose to go with you, your compassion for the breed is amazing! Everyone who meets Cy comments on how well behaved and attentive a puppy he is. You’re so easy to talk to even if I would ask a dumb question. I just love him so much, thanks for everything (Tell all who was involved thanks). Beretta is an awesome dog! She attracts attention wherever we go. Her intelligence, confidence and disposition are exceptional. We have never ordered a dog sight unseen or over the Internet, and have had many dogs over the years. 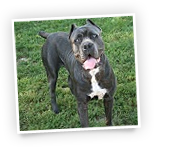 Our experience with Shipley Cane Corso went exactly as they said, and we would highly recommend them to anyone without reservation. We had a great experience and would do it again. Gucci is doing great! we just love her, we couldnt ask for a better pup! she is quite the couch potato and she loves to sleep! We can’t thank you enough. She also is already house trained now. I had such a great experience purchasing a Shipley puppy. During the purchase process Justin Shipley provided me with videos of my puppy he spent numerous hours answering my questions during my purchase process and after receipt of my puppy. He conducts himself with a professionalism which is a testament of how much he cares about his dogs as well as his customers. 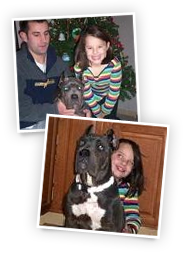 I purchased my first Cane Corso, Nicah she arrived to us on December 16, 2009. 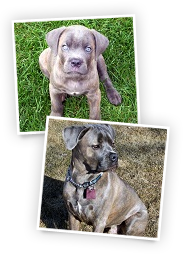 She is everything I expected of the Cane Corso Breed, she has a wonderful temperament, and has blended perfectly into our family. 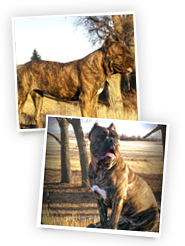 I believe there is no better breeder than Shipley Cane Corso! They kept me so up to date on my puppy with pictures and videos. Even though Nala is several months old Justin is always there to answer any questions. Our vet even backs the Shipley’s for producing such well tempered and healthy dogs. Thanks Justin, I can’t wait for puppy #2!! 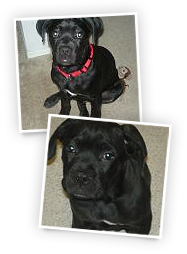 My experience with Shipley Cane Corso was very pleasant, there were always updated pics of the puppies. Justin was always there to listen to me and answer any questions that I had about the breed. She was my first Corso. I am so happy with her I could not describe it in words. I do not have a single complaint about my puppy. Shes seven months old and just won her first dog show. Best Of Breed first place. It doesnt get much better than that. Hi Justin, Gozer is a very quick learner. He loves goin to the beach and running around in the waves, there is a state park across the street that he also loves going to. I can take him off his leash if there aren’t many people around us and he won’t try to take off, stays in about a 5′ radius around me, that is one thing that a lot of people are very envious about. He loves playing with other dogs too, very social boy. He’s protective of his moma and his house, he will bark and growl if he thinks something is wrong and will always step between me and a stranger approaching me, but will warm up easily if I tell him it’s ok. It’s amazing how he can transform from playful puppy to scary protector in a second. We couldn’t ask for a better dog. We love our new baby Mr. Biggs because he is soooo lovable and really looks up to his "big" brother Steel. Mr. Biggs is so funny because he thinks he a small puppy like Steel and tries to jump up on everyone… and knocks them down—it’s great!!! When other people see him, they all say WOW HE’S HUGE!!! And we love to see their expressions when we tell them he’s only 5 months old. We can’t imagine our house without him!!! My fiancée and I are extremely pleased with our Cane Corso puppy Bosco from Shipley Cane Corso. He is 5 months old and already showing extreme protection for his family, he is really good with other dogs including other mastiff’s (we also have a Dogo Argentino), he has an amazing personality and is in every way absolutely loveable! WE LOVE YOU BOSCO BEAR!!! 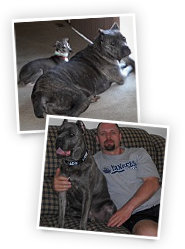 We would like to describe our experience with Shipley Cane Corso as well worth it! 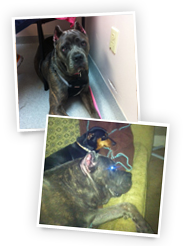 At Caesar’s initial checkout, our Veterinarian was impressed by his overall care and condition. 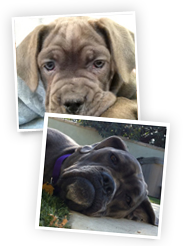 We truly love our puppy and our experience with Shipley Cane Corso has been amazing! I’ll refrain from mentioning that we actually want another one! LOL! Thiago has been such a sweetie pie from day one. He’s very close to us, and really hates when he’s not right with us. Has a huge appetite, and will eat anything, and I mean anything, in his path. He really is great and everyone always comments on how lovable he is to anyone who we greet with acceptance. I also know that he would definately protect without hesitation. I read somewhere that the perfect guard dog is a dog that you’ll never even know his protective side unless he thinks his family is in danger, and that is absolutely our Thiago. He’s just goofy and loveable as can be. We hope we’ll be adding more Corso’s to our family in the future. They are truly wonderful dogs in every way.